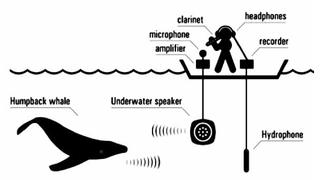 Do whales appreciate clarinet music? "A sound spectrogram suggests that the whale may have altered his song in response to the clarinet." ...says the professor. And the resulting paper ‘Whale Music: Anatomy of an Interspecies Duet' was published in Leonardo Music Journal (MIT), December 2008, Vol. 18, Pages 47-53. • An alternative version of the paper (To Wail With a Whale: Anatomy of an Interspecies Duet) can be read in full here.